*Please note that this brand new bracelet comes in PINK! All super sale items are non-returnable. Stylish, thicker design 3" chewy bangle bracelets made of rubbery silicone that is hypo-allergenic, resistant to bacteria, and free of BPA, PVC, lead, and phthalates! These smart new chewable bracelets are thicker / wider than our original Chewy Bangle Bracelets (which are no longer available/being made by the manufactuter). 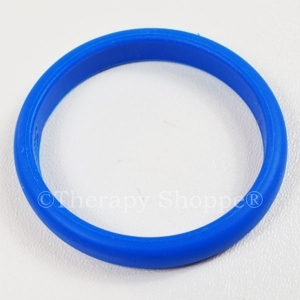 Designed for mild-moderate chewing, Thicker Chewy Bangle Bracelets are an effective oral motor chewy tool for self-regulation; it also makes a a convenient bendable silent classroom fidget! Comes in random assorted colors. Smart and subtle chewy jewelry that fit most teens-adults. *Please note - all chewable jewelry and chewies require adult supervision, need to be inspected frequently for wear, and replaced at the first sign of breaking down. The life span of any oral motor chewy tool depends on the frequency and degree of use. Chewies are non-returnable.